iKana has just completed a major makeover and it’s now better than ever before. 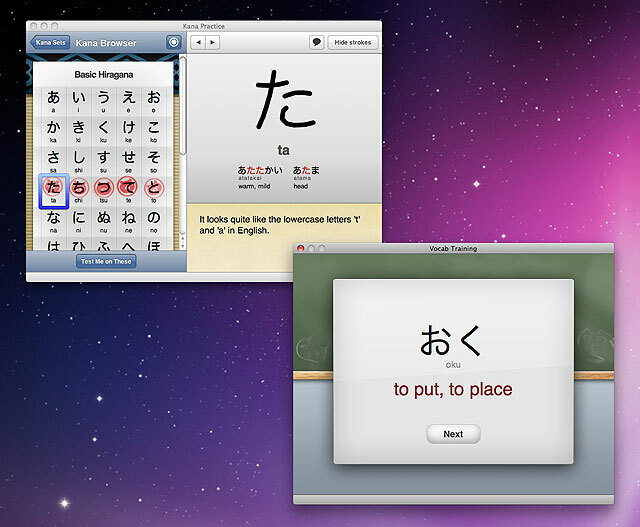 Not only will it teach you hiragana and katakana, it now has an ongoing role as your personal vocabulary tutor. Spiced up with some Leitner based spaced repetition goodness and wrapped in a beautiful and playful interface. The major new features in version 2 include the redesigned UI, stroke animations, kana sounds, an improved kana recognition test and the new vocabulary training system. iKana 2 is a free update for existing customers. If you don’t already own it head on over to the Thinkmac Store and buy a license, it’s only €12 (around $15).